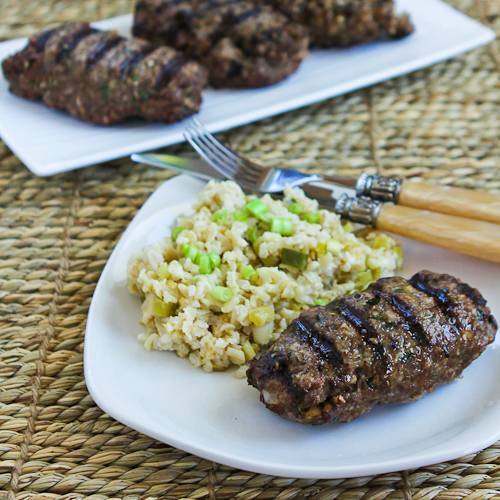 Hamburger Kebabs are a delicious alternative to burgers for ground beef on the grill! And these delicious Kebabs are Paleo, low-carb, low-glycemic, gluten-free, and South Beach Diet friendly. Use the Diet-Type Index to find more recipes like this one. Click here to PIN Hamburger Kebabs (Kabobs)! If you’re looking for something to make from ground beef that’s a bit more unusual than regular burgers, these delicious Hamburger Kebabs (or Kebobs) made with ground beef and seasoned with chopped onion, parsley, pine nuts, and dried oregano are a fun idea. I first made these for a blogging event where you had to use a cookbook published between 1920 and 1975, and I found this recipe in James Beard’s How To Eat Better For Less Money, a book I’ve had for many, many years! Even though the book is so old that you can now buy it for a few dollars, it still has some good cooking information. One thing that puzzled me the first time I made this recipe was the instructions to marinate the kebabs in “French” dressing. Then I realized James Beard meant vinaigrette, and it made more sense. I just brushed the vinaigrette on before I put them on the grill, and it did keep the meat juicy and delicious. I did change one thing in this updated version of the recipe. Since James Beard wrote this before food processors were common, his recipe called for chopping and mixing the meat mixture by hand. I used the food processor to chop the onion, parsley, and pine nuts and then put the meat in the processor and used it to mix in the other ingredients. If you don’t have a food processor, just do it by hand the way James Beard did! Coarsely chop the onion, parsley, and pine nuts, then put them in the food processor and pulse until they’re more finely chopped. Add the hamburger, egg, and spices and pulse until the mixture is barely combined. (Don’t over-mix.) The third photo shows how it will look when you’ve mixed it in the food processor. If you have thick blade type skewers or the double skewers like I have, they will work best for these kebabs. If you’re using wooden skewers (that you have soaked) I would use two for each kebab. I just used a low-sugar purchased vinaigrette to brush on the kebabs before I put them on the grill. Cook kebabs over medium-high heat, turning a few times, until the meat is firm and slightly browned. Of course I have to try for grill marks, and they turned out pretty well. We cooked the kebabs about 15 minutes, but actual cooking time will depend on the temperature of your grill, the temperature of the meat, and even the temperature of the air if you’re cooking outside. Serve hot. Make it a Meal: Serve with Arugula and Gorgonzola Salad with Balsamic Vinaigrette and Grilled Asparagus with Parmesan for a low-carb meal! Hamburger Kebabs instead of burgers on the grill are a great way to switch it up! Coarsely chop onions, parsley, and pine nuts. Put them in the food processor and pulse until they’re more finely chopped. Form meat mixture into four cylindrical shaped pieces. If you have double skewers like I used or blade type skewers, thread kebabs onto skewers. If you want to baste the kebabs with dressing as they cook, be very careful because the dressing that drips down will flame up when it hits the hot underside of the grill. Lay kabobs across the grill grates to get crosswise grill marks. Cook, turning a few times, until the kebabs feel firm (but not hard) to the touch and the meat is well browned. We cooked the kebabs in these photos about 15 minutes, but cooking time will depend on the temperature of your grill, the temperature of the meat, and even the outside temperature if you’re cooking outside. This recipe adapted slightly from How To Eat Better For Less Money. This recipe is great for low-carb or Keto diet plans, and as long as you use lean ground beef and low-sugar vinaigrette to brush the kebabs, this recipe is perfect for any phase of the South Beach Diet. Thanks Michelle; so glad you enjoyed them! Hi Kalyn, I made these Hamburger Kebabs today and they were SUPER! Simple and delicious! Thanks for your blog – it's great! Amy, so glad to hear that you enjoyed it that much. I'm really happy that my blog is working for your eating needs too! I just loved this recipe, as did my whole family. It might be in my top 10 Kalyn's Kitchen recipes. As always, I just have to give you a big thank you for your amazing blog and recipes. Low glycemic eating has recently become a medical necessity for me, and I don't know what I would do without your recipes. Having delicious low GI food helps me stay away from the temptations! Thank you! The rice recipe will be posted next week. These look delicious… but what is the recipe for the rice on the plate? Kate, so glad to hear you enjoyed the recipe. I just made these last night. They were amazing! Thank you so much for sharing them. Kelley, ground sirloin would be wonderful for these. I do love the idea of brushing with vinaigrette, both for flavor and to keep the meat moist. These remind me of the ground sirloin kabobs that I love at a restaurant in southern California. I bet brushing on the vinaigrette just before grilling adds a ton of flavor! Thanks Richard; glad you like it! Thanks Christine. I agree, his recipes are always great! In my experience Beard never disappoints. Very nicely updated, Kalyn. Pinned it! Thanks CJ; same to you! Kate, so glad you enjoyed them! Lydia, I think Greek seasoning would be a great addition to this! Donna, you are so kind; thanks! Shirley, I was amused by the idea of "French" dressing! Claire, haven't tried either of those variations, but would love to hear how it works if you try it. Wondering if anyone has tried this with ground turkey. (We can get dark meat ground turkey at Whole Foods) and using ground flax seed as a substitute for the egg (or just leaving the egg out). (I am learning to cook without egg, dairy, wheat, beef, and a few more due to some food reactivity in our family). Yours is one of those food bogs that I look forward to reading because I learn something every single time. I am most definitely going to try brushing meat with vinaigrette right before I grill it. Thanks for all you have taught me over the years. May you live and blog forever! In place of Vegesal, which is hard to find here, I think I'll use some Greek seasoning. The flavors would work very well in the kabobs, and I always have it in my pantry. I'm not sure what you mean when you say "would help." If you thought they were too dry without basting with the vinaigrette, then I think you could add some to the mixture. Kayln: I made these for the first time tonight. We both liked them a lot! My only question is, I didn't realize until the end that you were supposed to have basted the kebobs before they got broiled/grilled. I ended adding the dressing as an afterthought. Do you think adding a bit of the dressing to the meat mixture & letting it marinate a bit would help? I thought that might harden up the mixture a bit. Thank you so much for your index of recipes for the South Beach Diet. We have followed this before and are following it again – so to have your index is like a God send! Ish, don’t really know; I’ve never even had buffalo so I don’t know how it would cook up compared to beef. I made this recipe with ground buffalo instead of beef because thats what I bought. It was ok though lacked flavor — it tasted mostly just like the meat. I must have not basted enough of the dressing on or maybe need to spice it up a bit more. Any reason why this would taste drastically different with ground buffalo? Hi Kalyn, I found your website bc of the SB diet. It is absolutely brilliant! I wish I could come and live with you so that I could eat your recipes every day. I’ve made several things from your website and they are all super good. I think my favorite is this recipe, though. Instead of making kabobs I put it in the oven like a meatloaf. It is super good as meatloaf because it is light (thanks to the nuts and parsley) and less dense than your average meatloaf. Instead of dipping in ketchup, I made a homemade lemon vinagrette to dip in and it was delicious. I love your cooked cheese cake too! Keep up the recipes and experimentation. I love it! Yummy! Thanks for visiting my blog Obiter Dicta by Steve. I wish that I could come to the Utah Bloggers conference next week, but I’m in St. George. What’s old is new again! Looks really good! I’m always happy with Beard. What an awesome submission! Great job! Laura Rebecca, can’t wait to see what others come up with. Steven, You’re right, this was great retro food. I think this would have been pretty gourmet for the 70’s. Not sure about the sound of your mom’s French dressing chicken. I’ve never been a French dressing fan at all. Some retro food is great, this is a good example. The “French Dressing” thing triggered a memory, my Mom used to make a baked chicken dish that used the nasty orange stuff from the bottle and I remember it being quite good. I was about 10 at the time so consider that before you try it, I liked Count Chocula cereal then as well. Thank you so much for your submission — from James Beard as well, King of Cookbooks!